Memory foam molds pistol to holster for a custom fit. Superior quality materials used in our entire product line. The Equalizer is designed specifically to fit the Taurus Judge. The Equalizer is an ambidextrous and convertible shoulder/hip holster system and uses our NEW Speed-Retainer to secure the firearm. 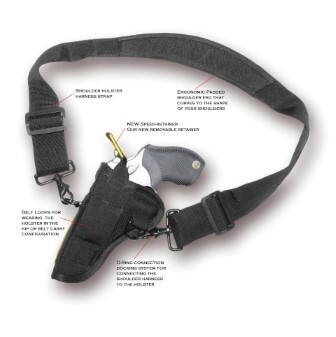 The Equalizer is low profile making it easy to be worn on the left or right side in a crossdraw or traditional carry. The Impulse - Semi-Automatic Pistol Holster Sub-Compact 2"-2.5"
The Panther - Semi-Automatic Pistol Holster Full Size 4"
The Shadow MP - Semi-Automatic Pistol Holster Full Size 4"